I imagine I am not the only one who feels the need to vomit (dictionary definition – “to throw up the contents of the stomach through the mouth”) when Israel’s Goebbels justifies the Zionist state’s ferocious and monstrously disproportionate attacks by air and sea on the Israeli-blockaded Gaza Strip, the prison camp which is home to 1.5 million besieged and mainly impoverished Palestinians. The Israeli to whom I am referring is, of course, Australian-born Mark Regev, the prime minister’s spokesman, for which read spin doctor. The more I see and hear him in action, the more it seems to me that he makes Nazi Germany’s propaganda chief look like an amateur. Compelling he certainly is but, as Sutherland indicated (I will be more explicit), only to Westerners and Americans in particular who have been conditioned for decades by Zionist propaganda and, as a consequence, know nothing or little worth knowing about the truth of history as it relates to the making and sustaining of the conflict in and over Palestine that became Israel. The flaw in that presentation is that Israel is NOT like the Western nations. It is a brutal occupying power, and the cause of the incoming rockets is its occupation and on-going colonization and ethnic cleansing of the West Bank including East Jerusalem, and its blockade of the Gaza Strip. That plus the fact that Israel’s leaders have no interest in peace on terms the Palestinians could accept. That’s one of the many big, fat Zionist propaganda lies. The truth is that Hamas is firmly on the record with the statement that while it will never recognize Israel’s right to exist, it is prepared to live in peace with an Israel inside its 1967 borders. Netanyahu obviously believes that by way of deception he can not only retain power but emerge from Israel’s next election with more power than ever. (Enough to tell Obama to go to hell if that ever becomes necessary). The support (by default if not design) of Western governments for Israel’s latest ferocious and monstrously disproportionate attacks also makes me want to vomit. I don't feel the need to vomit. Studying israeli crimes has given me a caste iron stomach. Caste iron in watching their crimes and caste iron in judging their crimes. for expressing so poignantly what most of us feel in these moments. The frustration for being unable to do something right now in order to stop the carnage and silence the deafening lies around us is unbearable. This is how I have felt about the spin doctor so thank you for putting it into words for me. Of course as long as we Americans have a corrupt. Congress bought and paid for by Israel nothing will change. I have no faith in Obama finally standing up to Israel and earn the peace prize he was given prematurely. I was expecting this latest Israeli attack after Saudi-Qatar money drew Hamas away from the 'Axis of Resistance' (Iran, Hizballah-Syria). Now, the Zionist entity feels free to carry out another genocide of the 1.5 million native Muslim and Christian Palestinians without fearing that Hamas and Islamic Jihad will receive light arms from Syria, Hizballah or Sudan. However, I did feel vomiting when I heard the news that the White House has condemned Hamas for defending Gaza by shooting a few rockets at Israeli Jews without killing even one of them. US-born British writer, Lasha Darkmoon was 101% right when she said that the United States has become an Israeli colony. What is this Australian doing justifying an attack on Arabs? What is he doing in the region in the first place. He is exactly why Gaza will never surrender and the rockets will never stop. An Australian is shooting at these people who are indigenous to the area. It is outrageous and nobody says anything. These "mowing the lawn" military stunts have the virtue of concentrating in time Israel genocidal policy, the policy that is otherwise enacted over decades and remains less discernible to any one generation. They are smart, but not smart enough. The slow genocide still qualifies as genocide in the language of international jurisprudence. Frankly, Israel can not kill hundreds of Arabs without earning some demerits internationally. But it would be nice for once if some hundreds of Israelis bit the dust just once, say in Tel Aviv, so they can feel the pain. I guarantee Israeli policies would change as a result. And you still think a second term for Obama is better than Romney? They are the same. As Julian Assange said, Obama is a wolf in sheep clothing. To the Palestinians it is a question of: "Would you rather be shot or hanged?" Either way they are dead. Obama or Romney, a black dog and a white one and I must apologize to the dog specie. Surely it so nauseating to live in a world where a certain clique of people abuse their aquired military power. I now understand why someone would agree to be a suicide bomber. I now even understand the frustration that caused septemeber 11. The Israelies and the Americans must ever know that their children will always live in fear as long as Palestinians are treated as non citizens of this world. To those who drink with Obama during his pastime, get his honest opinion for me on what he would have done if he were a palestinian in Gaza, or if he were born to a Palestnian mother - a people whose creation Israel and America regard as a mistake. And Zionists too, with their contemptible behaviour, are also bringing upon themselves their fate. It isn't Palestinians who are going to drive them into the sea, it is they (Zionists) themselves who are going to do this. The waters parted once for Moses...I don't think think this 'miracle' will happen again. What irony...the persecuted turning into the persecutors and just as vicious. 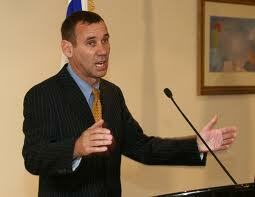 Mark Regev is a reptile in human skin. I cannot imagine such a blatant liar parroting the most sickening lies to be human. He and his partner, Michel Oren, are busy bombarding the US with the most odious hasbara. And of course, Obama, being totally humiliated by Netanyahu, is joining in. Disgusting. Maybe Regev was born in Australia. So how come he has a South African accent? Like David I got a caste iron stomach with the Zionistes doing everything they want with the applauses of most "freely elected" or to be exact of most "freely corrupted" western leaders. "The support (by default if not design) of Western governments for Israel’s latest ferocious and monstrously disproportionate attacks also makes me want to vomit." It makes vomit indeed when the zionist and western media such french ones call this blitzkrieg against civilians a "war". A "war" ?!!! A war is a confrontation between two states! There is no palestinian or ghazawi state recognized by the zionist or western states! Alan - you need to remind the world that the Palestinian refugees (ie more than half of Gaza) are entitled to go back to their homes. If the Palestinians refuse to give up their right to return (as they're doing) then Israel has only 2 alternatives, either to comply with International Law or murder them all. UNGA Resolution 194 was passed with 35 for and 15 against. The 6 votes against to which you refer, were probably the 6 involved Arab countries: Egypt, Iraq, Lebanon, Saudi Arabia, Syria and Yemen. Maybe Adolf was onto something after all?! The most telling point for me in this piece is that Israel is NOT like western nations; and that it is instead a brutal occupying power. Hamas has claimed downing of an Israeli F-16 fighter-jet and capturing its two pilots. Russian Television (RT) has confirmed Hamas claim. Israeli Channel 2 has reported that the Jewish army has indeed lost contact with the two pilots. Israeli military officials have warned Israelis to prepare for upto seven weeks of war on Gaza. "Maybe Adolph was onto something after all?" ? That kind of racist comment will play into the Zionists's hands. They want to believe that critics of Zionism are Jew haters so they can play the victim card and smugly ignore all of us. Rick, is that your intention? This all goes back to the alleged "Holocaust". Because if this event actually hppened twice (after WWI too! )then all "goyim" (non-Jews) are subject to eternal retribution. America, for instance, "did not act quickly enough". So it, too, is guilty. We are not allowed to do simple mathematics in many countries that could potentially disprove the figures on an elementary level. How does a people who lost a third of its population actually show an INCREASE in population in 1948? How do you kill more of a people than actually existed in areas of Europe you occupied? Why do the "Holocaust" figures remain unchanged when the death toll at Auschwitz, for instance, has been reduced downward by 75%? As long as the world continues to accept the idea of Jewish exceptionalism than we are going to have Gaza and more Gaza--because Jewish life is inherently more valuable than other human life. The end of the Iraqs and Irans and Gazas--coupled with the actions of the robber financiers--will reduce the world non-Jewish population quite substantially. the jewish state has no right of existence.there was never any acceptence in the middle east of ajewish state.george marshall gave pres truman awarning that ajewish state is athreat to american security.ernest bevan warned truman that it would never besolvible. israel is an expansionest state.the wests problem it allows for the occupation ,annexation and dispossession of palestineans homes and lands .the west has sanctioned the occupation of lebanon syria jordan and egypt.the west liberated kuwait .but allows isreal the fruits of war.israel is apariah state.no one in media talks about land seizures in the negev desert.the bedouin were given land titles in 1928 under british mandate. zionists are all vomit. Thank you, Mr Mandolini-Pesaresi for this article about the rockets. I run into the same problems both here in the US and in Italy. For the record I was a passionate Zionist about twenty years ago. Most of my christian friends still are. It was a matter of Divine Law whereby I changed my mind, as well as the fact that I am a history buff who researched the beginning of the state that usurps the name Israel. But I was a zionist and I did change my mind. "The truth is that Hamas is firmly on the record with the statement that while it will never recognize Israel’s right to exist, it is prepared to live in peace with an Israel inside its 1967 borders." "We have already stated repeatedly that we accept the existence of Israel within the 1967 borders as a political reality even if we do not approve its moral legitimacy. Israel on the other hand has never recognized the right of a Palestinian state to exist even under the PA, despite the PA recognizing Israel’s right to exist. All Israel has recognized is the legitimacy of the Palestine Liberation Organization as the sole representative of the Palestinian people."